The 40–page booklet contains a devotion for each day of Lent. Each devotion includes Scripture references and an uplifting prayer. Click to view sample pages. They are ideal to distribute to every adult member of the congregation and those beyond the congregation that need a message of renewal, comfort and joy. The booklet is a PDF file, features a handsome cover and can either be printed or distributed via email. Alternatively, each devotion can easily be copied/pasted into your bulletin or other publication. 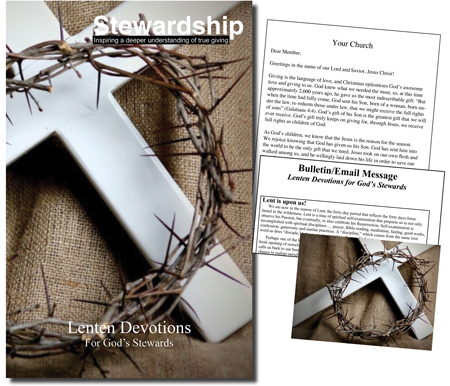 The package includes the downloadable Devotional booklet (PDF can be printed in either 8.5” x 11” or 8.5” x 5.5” booklet size), a letter from the pastor and bulletin insert (easily editable in MS Word format), as well as a high–resolution background image and reprint rights for your entire congregation!